I made the decision to become a vegetarian when I was fifteen. It had a lot to do with dissecting a fetal pig, and breaking its jaw, but I’m sure you don’t want to hear about that. What’s followed has been a hard-fought battle of trying to maintain a steady diet that includes the necessary protein to stay healthy. I’ve become quite attached to boca burgers, and I live on peanut butter, but it’s good to branch out sometimes. Black beans are my favorite kind of beans, especially in a Tex-Mex traditional quesadilla or taco. Which leads me to my healthy eating experimentation across the pond. It involves a lot of cashews, almonds, and pecans, just so you know. They’ve also constantly mocked me for my level of the mini fridge—filled to the brim with raw carrots, hummus, oranges, blackberries, raspberries, and pre-made smoothies. What they don’t know is that I have a rather plentiful supply of organic dark chocolate tucked away in my room. I’m keeping them ignorant of this particular fact for the time being. I value my street cred. Flat cred? Anyways, here’s a recipe for one of my favorite concoctions I’ve made while I’ve been here. I’m calling it the Fruitopian Salad, because obviously the fruit is the best part of this creation! 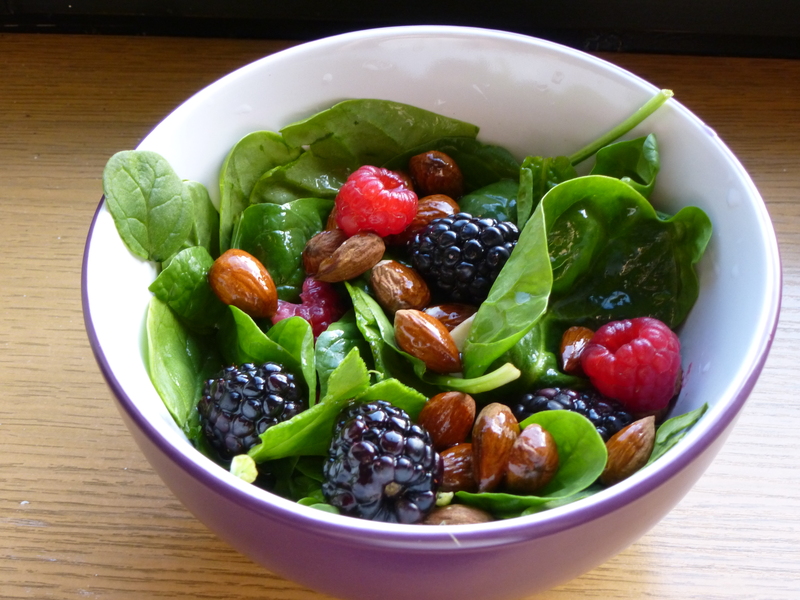 You just want to toss all the raw ingredients together—the spinach, blackberries, raspberries, and almonds. Then you mix the lemon juice and olive oil together in a cup and pour it over the salad! These are all rough estimates, by the way. Feel free to add more of anything! I prefer my dressing a little more lemony. Also, another good dressing staple to work with in fruit-based salads is apple cider vinegar. Add olive oil and some sugar and it tastes amazing for a little less tang and a little more apple-y kick. Judge me for being a health freak all you want, but I know how to make one awesome salad.